In recent years, DC animated films have followed a certain model, releasing two movies told within a continuity heavily influenced by the New 52, with one out of continuity standalone to follow. In the case of 2017, Justice League Dark and Teen Titans: The Judas Contract continue carrying the New 52 torch, with Batman and Harley Quinn being the outside the box offering. Up until now, not much has been known about Batman and Harley Quinn aside from the fact that it will be an original feature from the mind of one of the Clown Princess of Crime’s co-creators, Bruce Timm. Now, however, an image has surfaced that speaks volumes as to what we can look forward to. As it so happens, the folks at The World’s Finest spotted the first photo to be taken from the film on the iTunes extras page for Teen Titans: The Judas Contract. 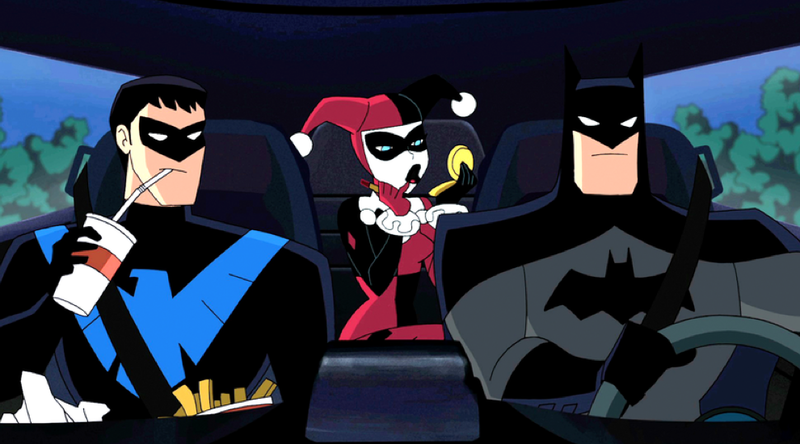 In it, we see Batman, Harley Quinn and Nightwing riding in the Batmobile, each sporting a look reminiscent of The New Batman Adventures. Right now, it remains unclear whether this will be a continuation of the “Timmverse” (which would be incredibly awesome) or if it simply takes visual cues from that established continuity but is its own thing, similar to Superman: Brainiac Attacks. We do, however, hope that they were able to secure the voice talents of Kevin Conroy, Loren Lester and Arleen Sorkin as Batman, Nightwing and Harley Quinn, respectively, no matter what universe this may take place in. Expect to learn much more about the film when a sneak peek to be included in Teen Titans: The Judas Contract’s Blu-ray release arrives on April 18. As for a concrete date for Batman and Harley Quinn, well, if the preceding years are to repeat themselves, we fully expect a world premiere to be held at San Diego Comic-Con in July, with a Blu-ray release to follow either later that month or in early August.